"The village was originally named Richwoods, then Sam White's, before becoming Batchelderville, in honor of William Batchelder, a justice of the peace, merchant, and mill operator. When the post office was established in 1879, the town's name was changed to Batchtown. 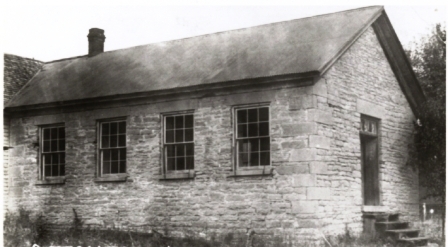 A history of the former schools located in Calhoun County was found at the Rootsweb address of http://www.rootsweb.ancestry.com/~ilcalhou/Education/ruralschools.pdf . A brief summary of this article states that Batchtown started a 2-year high school in the early 1920s. Batchtown High School continued to function until the Calhoun School DIstrict was formed for the 1951-52 school year. At this time Batchtown High School students were then bused to the new school's location near Hardin to complete their high school requirements. Batchtown supported a grade school through at least 1967. It is possible, according to Kermit Bell as relayed by Mark Heffington, likely had the first tennis court of any school in Calhoun County. The teacher got some of the boys out on a flat spot near the school and the shaved the grass down real low, used hoes to scratch out the boundary lines, and strung a fish net up to play tennis. This page was made possible through the excellent research once again by Roberta VanBriesen!! It is not known or clear if Batchtown High School sports were ever offered. Basketball, baseball and track may have been on order for the boys. If you have any information regarding this aspect of Batchtown High School please share it with us. Other activities of interest may have included dances, plays, band, chorus, and various clubs. If you have any information please contact us via the means listed below.